We’ve all come to depend on the apps we have on our smartphones, even when we drive. The problem is, it can be troublesome to use those apps while you’re on the road. Announced in 2014 at Google I/O, Android Auto brings the full power of the latest smartphones to your in-vehicle infotainment. The aim is to minimize your interaction with your phone and guarantee your safety and security on the road. The first versions of Android Auto were pretty useless unless you had a head unit in your car with a screen. As of January 2017, it works as a standalone app on your phone or tablet (running Android 5.0 Lollipop or higher) and can work with any car. Just mount your phone on the dashboard or windshield and use Android Auto without any additional hardware in the car itself. If your car has Bluetooth connectivity, you can integrate Android Auto into your car’s infotainment system via Bluetooth and make it start automatically when it connects to your car’s Bluetooth. The driver-friendly interface is super simple, user-friendly and intuitive with sizable text and enlarged round buttons for easy touch points, uniquely designed to keep you safe and undistracted while you drive. It even displays a bigger version of your notification panel along with the status icons and clock so that everything is visible at a glance. Another safety feature worth mentioning is that the onscreen keyboard only appears when the vehicle is parked. The three main buttons at the lowermost section of your screen give you easy access to the three most common things you’ll need on the road, namely: (1)navigation (2)communication (3)and music. The fourth icon (4)the circle button brings you back to the home screen if you are in one of these three screens, or it exits the app if you’re already at the home screen. The interface works both in portrait and landscape modes, the former providing much better information density and less scrolling. An enlarged version of the Google Maps navigation interface allows a user to view live traffic, set destinations and choose different routes. It provides voice-guided turn-by-turn driving directions to those destinations and specifies the estimated time of arrival. Navigation will continue to work in the background even if you switch to another screen and will remind you about upcoming turns or points of interest (gas stations, restaurants, etc.) along the way with heads-up notifications. Similar notifications will appear for incoming calls or messages with the options to automatically reply to them or to read them out loud. This functionality ties in directly to Google Now. Android Auto borrows much of Google Now’s context awareness to help you out while driving. For example, if Google Calendar knows you have to be somewhere at a certain time, a heads-up notification will pop up offering the shortest route to get there via Google Maps. Just tap it and you’re on your way! To call a contact you can use voice commands or the dialing pad. To use voice commands you need to enable them. In Android Auto the hands-free voice commands were originally designed to be triggered by the “talk” button on your steering wheel or by tapping the microphone icon in the top right corner of the display (5), but if you’re using it in standalone mode you can take advantage of the “Ok Google” trigger word. “Ok Google” allows you to start a voice search or have Google do something for you like call someone, send a message, find directions or play some music without touching the display. If you tap the phone icon it will bring up a list of the most recent calls and favorite contacts which you can tap to redial. When you receive a call, a notification will pop up with the caller’s information. To start the conversation you just need to tap the notification. Messaging is probably the most dangerous thing to do while driving. Android Auto takes care of that with the ability to read out messages you receive and dictate the answers. Tapping on the headphones icon will show your current media playback. The little down arrow, next to the headphones icon, brings up a list of all of the compatible media apps (music, radio, podcast) currently installed on your Android device. You can download more apps supported by Android Auto from here. 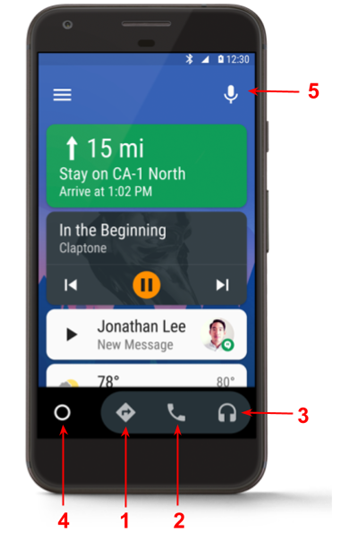 As with the communication and navigation icons, you can use voice commands to listen to music. For example, to resume listening to where you left off, just say “Play music”. Prior to the release of Android Auto 2.0, there were only a handful of third-party applications compatible with Android Auto and that’s understandable. With such a small audience up to this release, there was little motivation for developers to make their apps Android Auto compatible. Coming natively to Android on phones and tablets makes Android Auto available in every car and increases the pool of its potential users. Auto app development is very different than Tablet, TV or Wear app development. Android Auto is still very much in its early stages and its functionality is limited to some extent. We will see more features available to this platform in the upcoming months and years. At this point in the evolution of Android Auto, the possibilities for developers are very limited. The whole point of the platform is to help drivers focus more on the road and less on their smartphones. That’s why Google has designed it in compliance with automobile safety standards, including the National Highway Traffic Safety Administration (NHTSA) and the U.S. Department of Transportation. According to these standards, drivers should spend more time with their hands on the wheel and eyes on the road. Auto apps should complement and enhance the on-road driving experience without the distraction of things that aren’t essential while driving. 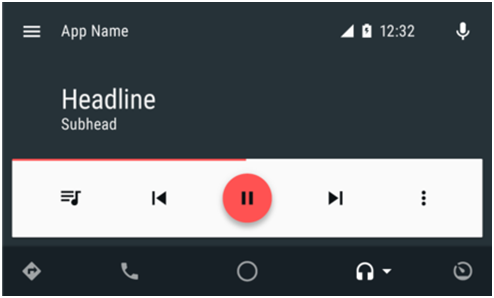 The current version of Android Auto only supports two types of apps: audio and messaging. 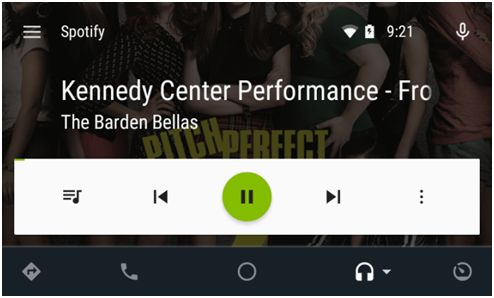 The most popular audio and messaging apps like Pandora, Spotify, Pocket Casts, Hangouts, WhatsApp, Skype and many others have already been updated to support Android Auto. There is no doubt that in the near future the range of possibilities for this platform will expand and we will see a more diverse range of apps compatible with it: apps with social media integration, location-aware apps (Foursquare, Yelp, TripAdvisor), traffic and navigation apps (Waze, CoPilot, Komoot), weather apps, news apps, reminders, etc. It is important to note that there will, of course, be no place for games! If you’re going to build an app compatible with Android Auto from scratch or extend an existing app, you need to take into account all the requirements and restrictions Google imposes on such apps. The good news is that Android Auto already provides a standardized UI and interaction model that will work across different apps. Most generic UI elements, such as navigation panel, controls, backgrounds, buttons and icons are provided by the platform. You only need to customize these elements to suit your app’s needs. We will highlight the most relevant usability requirements and best practices your app must adhere to in order to be qualified as an Auto app. For more detailed information check out the official Android Developers website. Once submitted to the Google Play Store, your app will undergo a driver safety review, and if it does not meet these requirements and best practices there’s a big chance that it will be rejected and not available for distribution. Keep this in mind. Have a great idea for an app? Book a free consultation today!